Philippe Coutinho is a happy man. Left frustrated as his prospective move to Barcelona from Liverpool failed to materialise in the summer, the Brazilian finally completed his transfer to Camp Nou on Saturday. And he made all the right noises at his official presentation on Monday. Not so long ago, it was Neymar trying to persuade his international team-mate to join him at the Catalan club, and although the two men will not be colleagues at Camp Nou after the former Santos forward left for Paris Saint-Germain in August, it is that transfer that ultimately led to this one. When Neymar departed in a world record €222 million move, Barca immediately set their sights on Ousmane Dembele and Coutinho. The French forward arrived in the summer for an initial €105m, Coutinho on Saturday in a €160m package. Monday was dubbed ‘Coutinho Day’ by the Blaugrana and it started early, with a thorough two-part medical examination starting at 7:30am, a transfer to Camp Nou at midday, the signing of his contract half an hour later, followed by a photoshoot on the pitch, his unveiling in front of the fans and finally a meeting with the press. The 25-year-old will be out for around 20 days with a thigh problem and although he was pictured with his new Barca shirt on Monday, there was still no number. If Arda Turan leaves Barca later this month, however, Coutinho will likely take the Turk’s number 7 jersey. 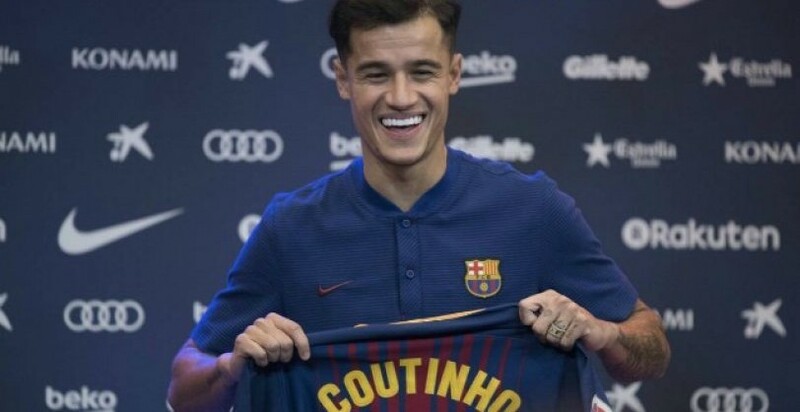 Coutinho will be the 33rd Brazilian to play for Barca and arrives in a deal that eventually be worth €160m, making him the most costly player in the history of the Catalan club and the third-most expensive of all time. He signs for this season and five more, while his release clause is set at €400m.